Fans of Doris Duke Theatre’s dynamic film program have even more reason to get their cinema fix at the museum—last week the theater installed a new Digital Cinema Projector (DCP). The new Barco 8S DCP also rounds out the museum’s unmatched collection of projectors, including the last vertical feed (a.k.a. negative pulldown) 35mm film projector in use on the island. Also on hand is the existing digital projector. This set-up ensures that the theater can show any format of film, be they from foreign countries with older technology or innovative filmmakers and distributors. 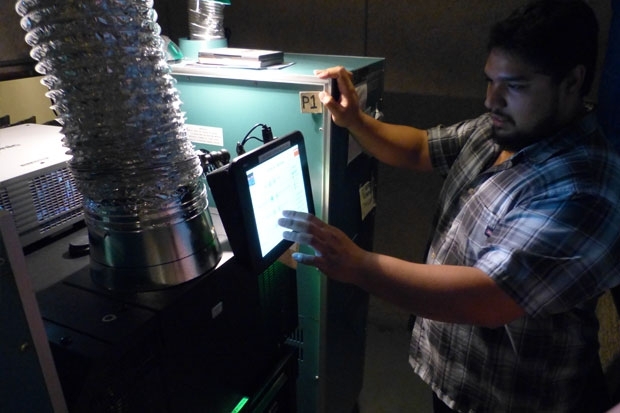 “This means instead of discs, files on hard-drives can be ingested directly into the projector, and we can program playlists, blackouts, and lighting cues all into one,” explained museum AV manager Eric Kelekolio during one training session, The new system allows projectionists to provide a seamless presentation to moviegoers. “The colors are also a lot nicer and the picture is superior to the old projector,” Kelekolio added. Finally, the new projector completes a technical overhaul that has been quietly underway for the past couple years during which the surround-sound system was upgraded and recalibrated to provide balanced audio, and a sleek new Harkness Hall projection screen was installed. Be on the lookout for gorgeous new screenings coming soon to this theatre near you! See the schedule of upcoming films. Thanks for making this investment in state of the art quality! Another good reason to be a member. Awesome news for all who appreciate high quality viewing experiences! What will be the first film to be shown on the new DCP format Barco ?